One thing about cycling is that you will always have time off the bike due to injury, illness e.t.c. In my case, these enforced breaks have been anything from one week to several years. Returning to cycling after a lay off can be a great feeling, but you have to be careful to manage it in the best way. Firstly, it can be very frustrating to be sitting on the sidelines, nursing some injury – These periods off the bike always seem to correlate to the best beautiful weather. Outside it’s sunny and dry – perfect for clocking up the miles, but you’re still hobbling up the stairs trying to detect any slight improvement in your strained muscle. How much fitness do you lose when you’re off your bike? After one week, you will begin to lose top end speed quite quickly. As soon as training stops, you find anaerobic threshold and VO2 max drop off fairly rapidly. Though after a few weeks, the rate of decline tails off. After two to three weeks, your endurance capacity will also start to fade away too. In one study, Madsen et al, cyclists who stopped training for four weeks found their ability to cycle at 75% of VO2 max dropped from about 80min to just over 60min—a 20% decrease. This is a good approximation of basic endurance fitness. Still 20% reduction from four weeks of rest is not the end of the world. Taking a month or two off the bike is never quite as devastating as it feels at the time. The body is adaptable – what you lose you can regain – there just needs to be a degree of patience. There is always a danger you could do too much, too early and aggravate rather than help the injury to get better. There are no hard and fast rules about how much you should do because it depends on type of injury and recovery. In some cases, light exercise can help get blood to the affected area and speed up healing. For want of any better advice, if you feel pain, it is a sign you might be pushing too early. If you can ride without pain, then it is a guide signal to begin lightly. During injury, some muscles will have wasted causing imbalances in the body. This can cause knock on injuries, due to over stretching other parts of the body. One thing I’ve noticed about recent injuries where I mainly landed on left hand side, is that I’ve gained muscle strains on my right hand side in my back because I’m overcompensating on the other side. Also, because I haven’t been using my left leg much, I can feel the muscles are really declining in power. When I wake up I feel my left leg involuntary stretching because the previously strong muscles are becoming much weaker due to non-use. Unfortunately, this has aggravated the imbalance between my left and right leg. After long break, start with short distances and a very steady pace. Build up distance and intensity gradually. The last thing you want is to over-stretch yourself. The good thing about cycling is that it is ideal for taking it gradually. You can cycle a few kms whilst maintaining a very low effort. It becomes nice if each day, you can add a few kms, taking it step by step. Be careful of setting goals too early. We are tempted to start thinking. ‘Right this injury is going to be over in 2 weeks.” But, you can’t put your own time scale on it. If you have a deadline, you are likely to suffer from failed expectations. 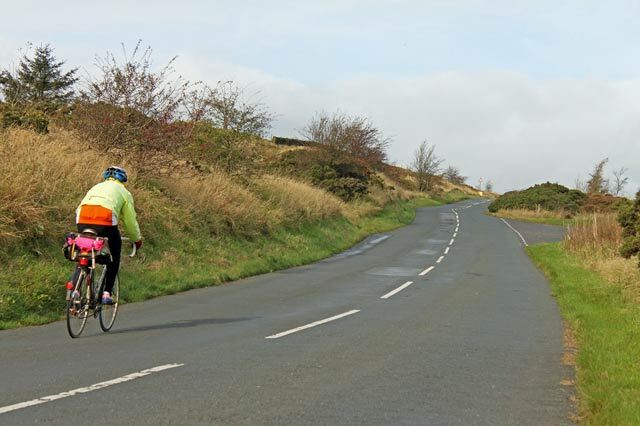 If you have a target for a 100 mile sportive 3 weeks after injury, it can become very tempting to push too hard. To achieve a big target requires great determination, but recovery from injury requires listening to the body and patience rather than stretching yourself. Once you have a fixed goal, it’s hard to be patient with yourself. Manage expectations. To use the oft-quoted line from A Fish called Wanda ‘It’s not the despair I can’t stand, it’s the hope’ Be wary of giving yourself unrealistic expectations of recovery. To use a footballer manager cliché just take each day as it comes and do what you can with that. It depends on the injury. Some heal very quickly, others can leave a persistent weakness (e.g. ankle injury) Seek guidance of medical professionals / physios as to how much you can train. Every injury will be different. Even, if you have no obvious pain, it may still be worth seeing a physio to gain feedback from recovery of muscles as you get back into cycling. A physio may be able to suggest exercises to help recovery and prevent future injuries. Don’t be discouraged about time off the bike. Your season really isn’t over if you take off 3 weeks in January. There is always some type of benefit from a break anyway. Consider cross training to maintain some basic aerobic fitness, whilst your cycling is limited. e.g. swimming may be great for people with knee problems because it doesn’t place any stress on the knees. Really take care to check your injury hasn’t left a big imbalance between one leg and another. I recommend going to a gym and doing a simple leg press exercise, if one leg can press 60kg and the other leg only 40kg, that is a big imbalance. Training with this imbalance is likely to cause other injuries down the line. Coming back from injury it’s even more important to do some basic physio exercises to regain strength in injured area. It’s one thing to come back to cycling after a 2-3 week injury. It’s another thing to come back after a few years off the bike. In my case, I took nearly five years off the bike between about 1998 and 2003/04. It was for many reasons, but apart from commuting into town, I wasn’t cycling. But, the old cycling bug was still there, and eventually I was enticed back into cycling. I took it steady and built up gradually, I was always worried about a return of the old knee injury. Looking back, I wish I’d known more about the benefits of physiotherapy. But, I didn’t and I just relied on taking a long time. But, when you get back into the rhythm of cycling you wonder how you managed without it. The buzz of exercise, the freedom of taking two wheels into the countryside and going wherever you like. It was good to come back. Let us know if you’ve had any useful experiences about coming back from injury. Jonny Bellis was a European U-23 Champion before suffering a nearly critical accident – when he was knocked off his scooter by a van in Italy. His doctors told him that he would never walk again and would most likely be paralysed from the neck down. At the end of May 2011 I was knocked off by a pedestrian while on a timetrial. I ended up up with a fractured pelvis-one week in traction but fortunately no surgery -it was just!! three cracks in the acetabulum-the big curved bit! I was then told 6 weeks on crutches not using right leg -it was noticeable how quickly the muscles wasted -after 3 weeks an X ray showed I could start weight bearing-I had exercises prescribed by the physio and religiously did these increasing volume every day-also enrolled at gym and did hand cycling (boring) to maintain some aerobic capacity. Crutches thrown away after 8 weeks. None of the physios/doctors would say whether or not to cycle so after about 6 weeks I started very light spinning on turbo-my thoughts were if it hurts I’ll stop. The upshot was I was back cycling outdoors 10 weeks after the accident-and in the August without intending to I did more monthly miles than I had ever done ! Quick recovery! Broke my pelvis and acetabulum in June 2012. 13 weeks in a wheelchair, then crutches, then crutch then stick (8 months aided walking). Back on the bike 1 year later. This was a tough one. If anyone is interested Facebook – Broken Pelvis Cyclists for top recovery tips and shared experiences! Great article. I was suffering from sharp pain in my right knee over Christmas which has got steadily worse until I cannot cycle at all now. I have much planned in April and May so its good to hear that 3 weeks off Will not end my year on the bike before it has started. And for knee pain it might be worth checking your position on the bike. The doctor believes it to not actually be a knee issue, but a tear in quad just above knee. A ‘Grade Two Strain’, 6 weeks full recovery time with latter 4 weeks active recovery involving light cycling and other strengthening exercises. My knee feel very weak indeed. Any experience or thoughts on this? I think recovery from injury is all about doing some sort of exercise, if possible, even if its only walking or in the case of a lower body injury, some upper body activity like light weight movements. I came off the bike a few years ago and ripped a rotator cuff muscle off the bone, this required surgery and three months in a sling, I did no exercise at all and when I was allowed to start again, my fitness had dropped dramatically. Two years ago I did much the same thing to the other arm doing Tai Chi, it required the exact same treatment, but this time I put extra strapping around the arm in the sling and got on the turbo each day for 30 – 60 mins at a very steady pace, sitting upright and being careful not to fall off, when I got the all clear I found that my fitness level was no where near as bad as before and soon returned to previous level. Something I heard or read recently. Two mice in a dairy were crossing a pail of cream when they both fell in. One mouse began to swim frantically but soon tired and drowned. The second mouse swam slowly at first then steadily increased his pace until the cream turned to butter and he was able to walk away to live another day. sadly coming back after an injury does tend to get harder as one gets older but there are things one can do to reduce the problems. At the age of 59 I ruptured my cruciate ligament and had to have surgery to reconnect it. The surgeon was adamant about the length of time I had to wait before I could start cycling – 8 weeks after surgery which was 16 weeks after the initial injury. However in the interim I did upper body and core strength training and seated boxing to keep my aerobic fitness going as well as following the instructions of my physio (a sympathetic triathlete) to the letter. As soon as I was allowed back in the pool I also started swimming. Once I was allowed back on a bike I started with an exercise bike with the saddle as high as I could stand it and then gradually lowered the sadly until my turbo trainer was comfortable. From the turbo I went onto a road bike minus cleats. I’m still awaiting the OK from the physio and the surgeon to use cleats but I can manage 25 miles quite comfortably and am getting up the hills – just! I had a hip replacement last December and was on the turbo trainer within 10 days, and probably back up to speed physically within three months – the main problem became psychological. I have just experienced a massive crash: shattered shoulder and arm, broken ribs, punctured lung, broken hip and leg, cracked pelvis, and knee ligaments. It’s been six weeks and I am going to attempt light turbo work with power meter to monitor progress. Interestingly the broken bones are not the issue its the ligaments and other areas where there is not a simple break. I don’t expect to be on the road for 6 mths though, but it’s surprising what you can do. In my case, I hit the rear end of a gravel lorry when he suddenly cut in front of me and brakes, I hit him around 45 kmh. I don’t recall the name act moments but the upshot was a fractured skull ( the helmet was pulverized) a compound fracture of the left forearm and a massive gash just above the knee, ruptured quad tendon and heavily torn quad., I am lucky to be alive, let alone contemplating getting back on the bike. So far, after 7 weeks, my head has healed, although the skull is now dented, my knee has healed to the point where I walk 3-5 km a day and flexibility is slowly returning, my forearm has been troubling me, but the doctor reckons it will come good, but i’ll be stuck with a vicious scar where the ulnar made its appearance.. I did ask my surgeon about when I might attempt to throw a leg over again, and as cautious doctors go, suggested I see him again in two months and just keep working the leg and get flexible again. Very frustrating for me as I live in Chiang Mai, Thailand and I’m missing all the great rides with my mates..